Fastening of the part by clamps and support pins. 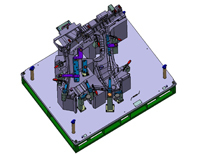 Option: in case of control of the part after its hot-stamping and after its laser cutting, possibility of integrating to the fixture rectractable support pins, to make the fixture suitable for the two versions of part. Control of the part shape and outline by a block - in resin or aluminium - with a gap and flush controlled by Go/No Go pin. Control of the deformation of the part main critical areas by dial indicator. Integrating CAPTOR-S or CAPTOR-C system to this type of fixture enables to reduce the measurement cycle time by 70% and to improve the reliability of the measurement. 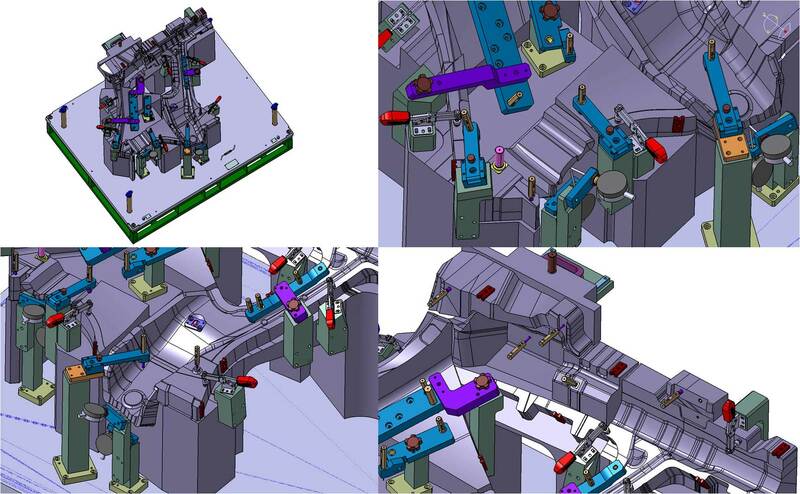 These systems thus enable to the production process to be more reactive - quicker decision-making, possibility of measuring more parts -. More information on CAPTOR-S and CAPTOR-C sections of this website.